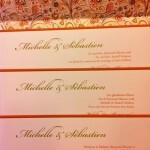 The above Wedding Invitation Example is Designed using K Paper. The art-work was designed by our client’s family member. It’s printed on hand made paper, blue ink color,scroll invitation. This set also includes custom Directions, Accommodations, map and response card. 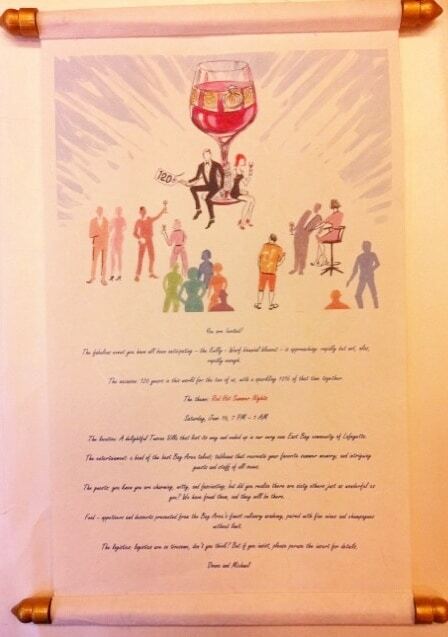 The Above example is a full view of the Scroll Wedding Invitation complete with the gold colored scrolls. The above example illustrates the Scroll Wedding Invitation in closed view, tied with gold tassel. To see our client’s Save the Dates, please go to our Save the Dates Category. This is a matching set which our client provided the art-work and we helped with the design using Tatex Thermography. 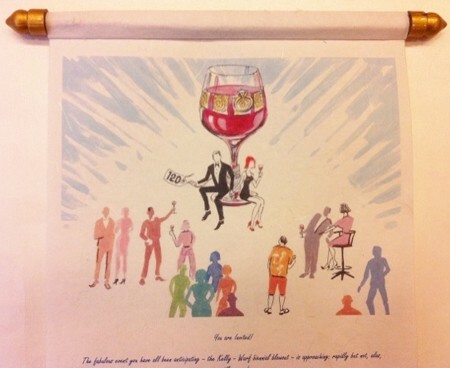 To see more scroll invitations please go to our Scroll Invitations Category. If you’d like to see our selection of Wedding Invitations please go to our Wedding Invitations Page or to our Blog under the Wedding Invitations Category for Design ideas.